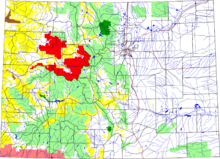 The forest highlighted in red in a map of Colorado. White River National Forest is a National Forest in northwest Colorado. It is named after the White River that passes through its northern section. It is the most visited National Forest in the United States, primarily from users of the twelve ski areas within its boundaries. 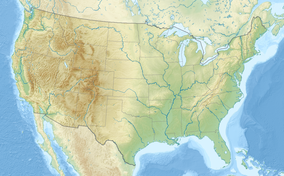 The forest contains 2,285,970 acres (3,571.8 sq mi, or 9,250.99 km²). In descending order of land area it is located in parts of Eagle, Pitkin, Garfield, Summit, Rio Blanco, Mesa, Gunnison, Routt, Moffat counties. The White River national forest provides significant habitat for deer, elk, mountain sheep, mountain goat, bear, mountain lion, bobcat, lynx, moose, raptors, waterfowl, trout and many other species of wildlife. The forest contains 1,900 mi. (3,058 km) of forest system roads, 2,500 mi (4,023 km) of trails, and the Dillon, Green Mountain, Ruedi, and Homestake reservoirs. The forest is managed from Forest Service offices in Glenwood Springs. There are local ranger district offices in Aspen, Carbondale, Eagle, Meeker, Minturn, Rifle, and Silverthorne. The Dillon Ranger district, run out of Silverthorne, was transferred from the Arapahoe National Forest to the White River National Forest in 1998. 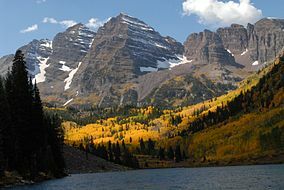 There are eight officially designated wilderness areas lying within White River National Forest that are part of the National Wilderness Preservation System. Five of them extend into neighboring National Forests (as indicated). ^ Table 6 - NFS Acreage by State, Congressional District and County - United States Forest Service - September 30, 2007. ^ USFS Ranger Districts by State Retrieved June 16, 2018. ^ The Virtual Dillon Ranger District Retrieved June 16, 2018. This page was last edited on 16 June 2018, at 16:58 (UTC).